You can easily get from Rome to Civitavecchia since there is an excellent train service between the Eternal City and Rome’s Cruise Port. The core service functions twice per hour and it takes around 70 to 80 minutes to travel the full route. However, do not expect punctuality from Rome’s public trainsportation and regional trains. The most convenient way is to get by train from Roma Termini station, but there are also other direct trains from popular stations as Roma Trastevere and Fiumicino Airport. Taxi and private transfers from Rome to Civitavecchia Sea Port is one of the most expensive options. For instance, private transfer from Rome to Civitavecchia costs 115 euro for one-way trip. However, it is the most comfortable way to reach the city and enjoy your journey with a maximum comfort. As an alternative, you can book taxi online. Getting from Rome to Civitavecchia port by train is the most convenient and cheapest option. The Rome Fiumicino airport has its own train station, while Rome Ciampino airport is connected with the Ciampino station by shuttle bus ATRAL. Since there are no direct trains, from Fiumicino airport station you have to take the train to Roma Trastevere or Roma Ostiense station and change the line in the direction of Civitavecchia. The journey will take around 2 hours with the price of 12.60 euro (8 euro + 4.60 euro). From Rome Ciampino airport, first, take the shuttle bus ATRAL to the Ciampino station. Your journey will take only 5 minutes with a cost of 1.20 euro. From the Ciampino train station, take the train to Roma Termini (1.50 euro, trains depart every 12 minutes). You can buy tickets on board. Then, from Roma Termini station, purchase a ticket to a regional train for 5 euro (1 hour 20 minutes) or an Intercity train ticket for 11 euro (55 minutes) or Freccia Bianca for 15 euro (45 minutes). The central station of Rome is Termini Station, which is the main public transport hub for Rome in the city centre. The trains stop at S.Pietro (40 mins), Trastevere (50 mins), Ostiense (55 mins) and finally Termini (70 mins). From Roma Trastevere station you can also go directly to the Fiumicino airport, while from Ostiense you can take the Rome Metro and go directly to the Colosseum or Spanish Steps. From Civitavecchia train station you can take a local Argo bus or walk towards the port. The Argo buses station is in front of the train station and they run every 20 minutes. The journey will take 10 minutes and the ticket costs 2 euro. You can purchase a ticket at the news-stand or at the bar inside the station. 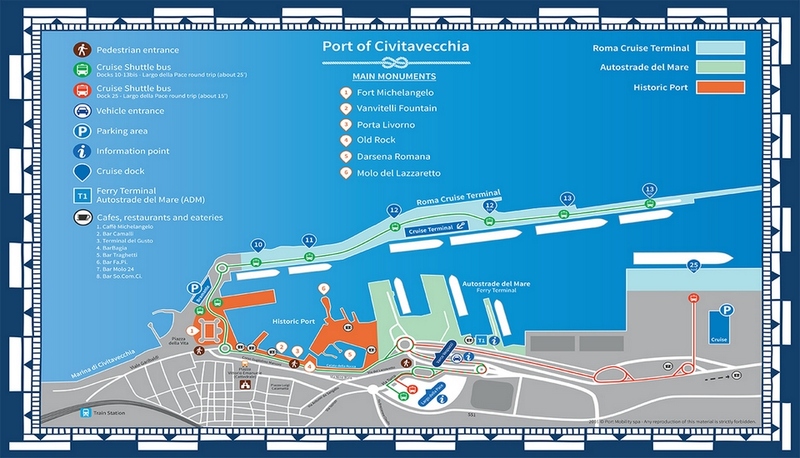 If you choose to get to Civitavecchia from Fiumicino Airport (Leonardo Da Vinci Airport) by car, it is in 60 km from the port and a drive takes 50 minutes, while Rome Ciampino Airport is in 85 km from the port, so the journey will take about 1.5 hour. 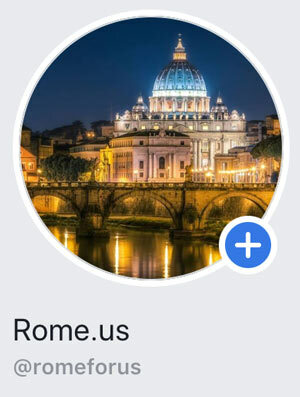 Of course, the most famous attractions are the Colosseum, Spanish Steps, Piazza Navona, the Pantheon, Roman Forums, Vatican, and many other churches, squares and monuments. Despite the fact that Rome is full of interesting attractions and points of interest, most of them located nearby each other. Undoubtedly, it is the city that you have to discover by foot. Pay attention to details, enjoy sunny weather and amazing Italian food. Better plan your trip in advance!